From Fairytale castles to underwater aquariums, we have found the most bizarre hotels to stay in on the planet (seriously you won’t believe what we found). Words by Greta Stonehouse. Sweden’s Ice Hotel brings a whole new meaning to “ice, ice, baby!”. As the name suggests it’s made entirely out of ice, making it one of Sweden’s seven wonders. Building material aside, the location alone is incredible, allowing easy access to the spectacular Northern Lights. This icy structure also boasts a rebuild every year, featuring a new interior design from competing artists. However you can expect one thing to always remain the same – the iconic ice bar where even the glasses are made from, you guessed it, ice! Dream big, literally, inside this repurposed crane, perched 17 feet off the ground. Originally used in the 1960s to move shipping containers, the crane has since been converted into a snug dockside accommodation for two. And if that’s not enough of a thrill, guests can harness their inner wild child and manually spin the crane to take in 360 degrees of the harbour views. We don’t recommend a boozy dinner beforehand! This is one underwater experience like no other. Situated 21 feet below the lagoon’s surface, the only way to get inside Jules Undersea Lodge is to scuba dive your way down. Once a research lab in the 1970s, this underwater guest suite resembles more of a plush aquarium. But seriously, who needs your usual flat-screen TV when there’s colourful fish gliding by your window? While the lodge requires all those who enter to be certified scuba divers, there are plenty of available courses for those wanting to learn. Alice in Wonderland meets Fear and Loathing in Las Vegas at this topsy turvy stay. Upside down rooms and suspended beds are just a couple of the weird and wonderful designs Propeller Island City Lodge offers their guests. While originally designed as an artwork, it was later transformed into a hotel taking experiential art to a whole new level. The website claims it is a place for philosophers and creative individuals, but we think it’s also a must for any sight-seeing traveller with a penchant for quirk. Talk about being stuck between a rock and a…er…2835 metre fall! The Bivacco Gervasutti is precariously positioned halfway off a rock ledge in the Frebouze Glacier mountain range. Originally built in 1948 out of timber, it was given a futuristic metal makeover in 2011, complete with solar power and satellite internet. Thanks to its unusual positioning, guests are asked to use the power restrictively and to take their waste downstream with them. This is probably to prevent anyone partying too hard and toppling the whole thing over. 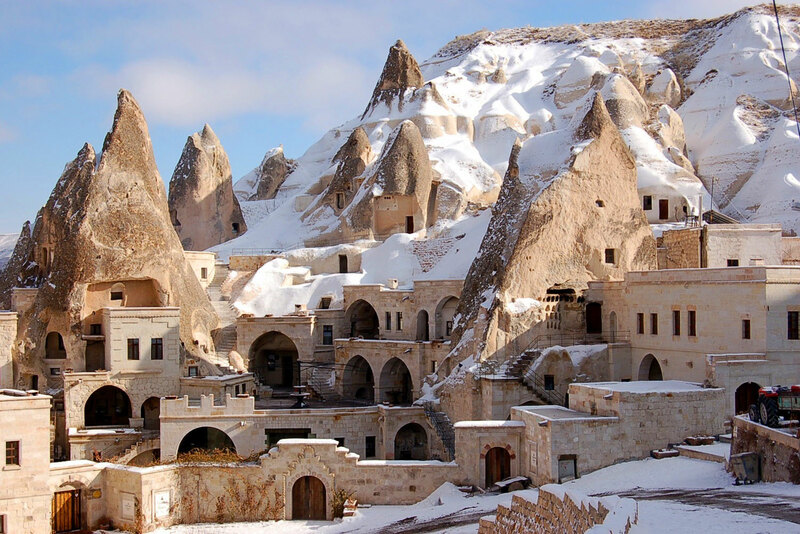 Yes, the name might stop 8-year-old girls in their tracks but this 1500-year-old Byzantine cave is more suited to geologists, or historians interested in Turkey’s ancient Cappadocia region. The Fairy Chimney Inn is carved out of a large tufa rock and is surrounded by spectacular lunar landscapes, and the famous tufa caves. For those seeking a unique spin on the Full Moon Party, every month people in nearby villages organise their own open-air parties in the tufa rock cones. Alternatively, if getting high is more your thing, hot air balloon rides are a spectacular way to see the Cappadocia’s landscape. Not for the feint hearted (or the unfit), this is one stay you’ll need to train for in order to climb the 60,000 steps to the entrance. While a cable car or a porter with a bamboo wicker chair are also available to transport you up the mountain, we highly recommend the sweatier option. The Jade Screen Hotel sits on top of one of China’s most famous landscapes, and walking up the Yupking Peak is the best way to immerse yourself in it. Views in winter are the most spectacular, shrouding the peaks and ancient pines in mist. Ever wondered what prison life would be like for the night, minus the criminal record? You can find out first hand at this old Latvian prison, which makes sure ‘guests’ truly are a glutton for punishment by signing an agreement upon entry. ‘Guests’ are then subject to sleeping in prison cells, being served prison food through iron bars and guards patrolling the corridors enforcing their strict rules. Originally constructed between 1890-1906 for the Russian Tsar Alexander the third, during the rest of the 20th century it served as a Soviet and Nazi military prison. Hey, it’s not our cup of tea but if feeling like a prisoner was ever on your ‘to do list’, this is your hotel. When faced with the world’s largest salt flat, the builders of the Palacio De Sal gave ‘excess salt intake’ a whole new meaning. Palacio De Sal was first constructed in 1993 entirely out of salt blocks, and in 2007 was re-built in another location on the edge of the Great Salar De Uyuni, in Bolivia. As well as the building, all the chairs, beds, tables and sculptures are constructed from salt. Therefore guests are politely instructed to ‘please refrain from licking’ during their stay. You can join the mile-high club on ground in this vintage 1965 Boeing 727, nestled in the coastal rainforest of Costa Verde, overlooking the Pacific Ocean. Originally used to fly passengers on the South Africa Air and the Columbian Avianca Airlines, the aeroplane has been refurnished and relocated 50 feet up in the trees. The view emulates a sense of flying and the interior consists of two air conditioned bedrooms decorated with hand-carved teak furniture. Noisy hotel guests won’t be a problem unless you count the native sloths, toucans and monkeys who reside amongst the canopies above.